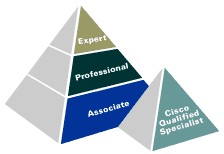 We offer live Cisco Training Boot Camp Classes throughout the U.S. Our Cisco Boot Camps are accelerated, and they include hotel accommodations, most meals, course materials, and on-site examination delivery so you can accomplish your Cisco certification goals quickly and efficiently in a distraction free environment. Test preps. Hundreds of Practice Test Questions to prepare you for the certification exam. Training for CCENT, CCNA, CCNA Security, CCNA Voice, CCDA, CCDP, CCNP, CCNP Voice, CCNP Security using a unique virtual classroom. Our virtual classes were the first to provide a learning experience to successfully match the benefits of instructor-led training to your desktop or laptop. You interact Live online with the Cisco instructors (accredited with a CCIE ™ or Double CCIE ™ Credentials) who have written the Cisco Courseware. $495 Online One year access.